The Children’s Court, Smithfield, Dublin 7. A protest gathers ahead of the trial of a 17-year-old for ”false imprisonment’ during a sit down demonstration in Jobstown, Tallaght, Dublin in November 2014. Former Tanaiste Joan Burton is listed as a witness for the prosecution. Friday: Paul Murphy TD: Will You Get Behind Us? Posted in Misc and tagged Irish Water, Joan Burton at 10:16 am on September 19, 2016 by Broadsheet. AAA – attempting to pervert the course of justice. Ha! I don’t think that’s the direction the political pressure has been coming from. Whatever about political pressure on the judiciary to not prosecute, the attempt to outlaw peaceful protest is very worrying. Well said. Joan seems to forgot, that her Labour party had a similar sit down protest in Shannon to protest the use of Shannon airport by the US Military. “Peaceful protest” does not necessarily mean it is legal. A sit-down protest is peaceful, but may result in you getting arrested. Forcibly preventing someone from going about their daily business, while not violent, is most certainly illegal. There’s a difference between obstructing traffic and false imprisonment. You may want to read the Public Order Act, and compare it to the Non-Fatal Offences Against the Person Act. They could have arrested the teenager at the time, for wilful obstruction, failure to obey the instructions of the Gardaí, and prosecuted him in the district court. Instead, they decided to go heavy handed with dawn raids, and a charge which carries a life sentence. (b) on conviction on indictment, to imprisonment for life. Yes , the childrens court is going to hand down a life sentence, that’s going to happen. I didn’t say it was going to happen. It’s the maximum penalty. This defendant could have gone before a jury trial, and I doubt a jury would have even returned a guilty verdict, considering how improper the charge is, considering the circumstances. But in a judge only court, a guilty verdict is more likely. That then lays out a marker for the adults in the later trials. and they’ll deserve what they get. I would agree with you in relation to the false imprisonment thing. 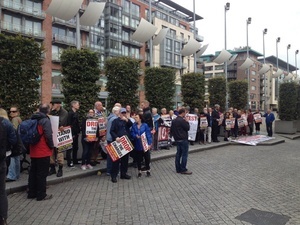 Thousands attended a peaceful protest in the streets of Dublin on Saturday, as they have many times before. You’ll see some form of peaceful protest most days outside government buildings. You don’t need me to spell out the difference. Why is the charge in inverted commas? I feel sorry for the young man involved but it was not a peaceful protest. As for the appeal for €2K bail – why isn’t Murphy ponying up the dough? He led them on and has plenty of cash. Murphy, a politician, trying to influence the independence of the judiciary. That is not acceptable. Murphy, a politician, trying to influence the independence of the judiciary. Where’s he doing that? The DPP isn’t the judiciary, and neither is Joan Burton. He’s not asking the Judge to drop the charges is he? It says “Drop the charges” on the placards they are holding. Yes it does. You’ve passed the reading comprehension part of the test. Now for the logic question. In a trial, the prosecutor can drop charges, or the complainant withdraw them. The judge cannot drop charges. 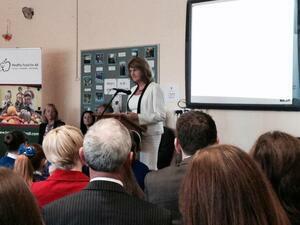 (b) the DPP and Joan Burton ? Google can help you find many, many inaccurate headlines. The judge can strike out charges, not drop them. Only the parties bringing the complaints can drop them. Of course you don’t want to play, because your point doesn’t stand up to scrutiny. Murphy couldn’t pay the bail – he’s too busying playing the poormouth so he can get himself free legal aid. This “Child” can just seek for Spent convictions in a few years, the only way it could affect his “life and future” is if he plans on traveling to America. The court will decide on the outcome of the trial, if he’s found guilty he knew what he was doing and should have thought of the consequences. Once again Paul Murphy showing his true colours. 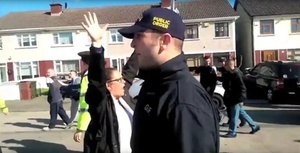 Joan Burton is pressing charges against a 17 year old for blocking her car. This is the calibre of person she is. Bit more to it than that. How about letting the court get on with its business? They a trying a teenager on charges of false imprisonment, when the Public Order Act was the appropriate response. That is an abuse of the legal system, and it is political interference. Who elected to bring these false imprisonment charges? Am fairly certain that it was the DPP, and not Joan Burton. The ‘political interference’ is all coming from one direction. You have great faith in the independence of the DPP. And even if the charges were politically motivated (which I don’t believe to be the case), the defendants will be tried before a jury of their peers, who will be politically independent (well, as politically independent as anyone can be). What this kid done may have been illegal but hardly the crime of the century either. It looks like a political witch hunt so of course Murphy is going to make capital out of it, especially as FF have now said that water charges are gone. Think he may be a bit worried for when his own trial comes up. Murphy getting banged up would be a great career move. He can present himself as an anti establishment martyr on a topic which already has populist support. No matter how this pans out, the real losers here are Labour. +1, I’d say he is nearly sick with glee at what it would do for his electoral chances. Murph wants to be locked up. it will be the making of him. what happened in Jobstown was thuggery not political protest. If Ms Burton is delayed this time around because of protests, can we expect another round of dawn arrests and false false imprisonment charges? this is nothing but spite from the establishment and the right wingers. the funny thing is that a couple of weeks later there was a protest of farmers outside a factory down the country somewhere, that stopped workers going about their lawful business , in fact not allowing them leave the premises…..isnt that imprisonment? Are the protesters from that event not up in court? Make no mistake this is spite from Labour and the establishment. the message is clear….get back in your boxes you working class filth…. Farmers’ protests are held to a whole other standard. They damaged property, assaulted and intimidated staff in Wexford Dept of Agriculture a few years back and got away with it. Meanwhile, students at dept of Education got baton charged and Jobstown got dawn raids and court. This is like putting a plaster on an ebola rupture. I think that FG, FF and Labour have no idea of the anger out there. And making an example of this 17 year old is not a good idea. It won’t stop the protests and it won’t stop the anger and won’t fix anything. And people are looking for martyrs. And many are at their limits already. There were 80k people, from all over, out protesting on the streets of Dublin the other day and they’re probably all wondering where the coverage is? Now they’ll all go home, even more galvanised, and grow in number. So that’s yet more anger building. I’m afraid we will see actual violent protests if the establishment keeps ignoring the issues. Isn’t that how it always goes? And it won’t be water balloons being flung.